Freecool® direct evaporative air coolers by Workspace Technology deliver innovative low energy cooling for data centre environments typically delivering PUE figures of <1.15. Freecool® offers clients a choice of direct and indirect airflow configurations. 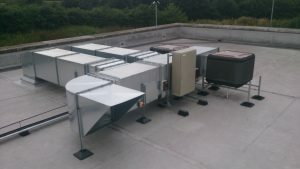 Freecool® direct evaporative air cooler installations are designed and built from scalable standardised modules that can be interconnected in a bespoke arrangement supporting ‘real world’ client applications. Freecool® direct evaporative air cooler systems deliver significant technical advantage over factory built single chassis alternatives that are very often cumbersome, expensive and difficult to deploy in many applications. Workspace Technology’s Freecool® direct evaporative air cooler systems can be installed as part of a new data centre or can be retrofitted and configured to work in harmony with existing cooling technology. Supporting rack densities from 1kW to 20kW Freecool® is growing in popularity and has become the preferred cooling technology for many public sector and corporate organisations. Freecool® by Workspace Technology delivers a truly flexible architecture. Freecool® direct evaporative air coolers offers standardised ‘modules’ that can be configured to create a bespoke cooling solution addressing individual client demands. With 30kW, 60kW, 90kW and 120kW modules, Freecool® is designed to support a wide range (<30kW to >1MW). Freecool® offers a number of configuration options, including indirect cooling through high efficiency heat exchange technology as well as mechanical backup or top up cooling. The Heat Exchange module is designed to support ‘indirect’ evaporative free air cooling. Workspace Technology has developed its extensive expertise in data centre direct evaporative air cooler fresh air cooling over the past four years. This expertise has positioned Freecool® by Workspace Technology as the direct evaporative air cooler free air cooling solution of choice by many data centre operators. Freecool® offers data centre managers a range of innovations to help improve performance. Conventional cooling will require a combination of controls, pumps, fans, motors and compressors depending on the technology. All these devices require electricity to operate. Workspace Technology’s Freecool® direct evaporative air cooler technology simply requires fans to control the flow of air through the data centre. Freecool® direct evaporative air cooler systems use an evaporative heat exchange process to cool air. This process takes advantage of the principle that ‘free’ latent heat is generated as a result of water evaporation. This evaporative heat exchange system simply reduces the air temperature as it passes through the water filter. When compared to air-conditioning which uses mechanical refrigeration, the operating cost of evaporative heat exchange can be up to 90% less than traditional air conditioning. Click here to view our Freecool® Direct Evaporative Air Cooler brochure.